The PDF booklet linked below has been prepared for the instruction and reference of altar servers at our parish. It is offered here as a service to the wider Church, for the use of those who may find it helpful for their own learning or for use in their own parishes. Any comments can be sent to subdeaconmichael@newmartyr.info. 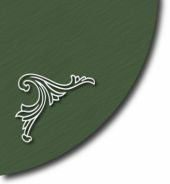 This guide does not offer any variations for the Episcopal Divine Liturgy. A guide with complete rubrics for clergy and servers at the Episcopal Liturgy has been prepared by Archpriest Andrew Phillips of the parish of St John the Wonderworker, and all enquiries ought to be directed to him. There is an understanding within certain parts of the Moscow Patriarchate that the liturgical fans are only to be carried at episcopal services; that is to say, at services at which the bishop is present and presiding. However, this more recent development does not reflect the origins and purpose of the fans and is far from universally observed, particularly within our Russian Orthodox Church Outside of Russia. As the honour due to the Gospel Book and Gifts does not depend on the rank of the clergy carrying them, (indeed, why would it?) our practice at St Elisabeth's is to carry the fans at every Liturgy for both entrances and at the Gospel, as well as at Molebens and Cross-processions. With that in mind, some will find it unusual that this booklet directs one fan-bearer to go before and the other after the clergy in the Lesser and Great entrances. This is a local variation for purely practical reasons. The solea in our church is very narrow, making it difficult for the clergy to overtake a fan-bearer once he is already in place. Another, perhaps more usual, practice is for both fan-bearers to precede the clergy and, if your church's solea is wide enough to accommodate this, it is perhaps better to follow this custom. For the same reason, the fan-bearers are directed to descend the solea for the Gospel where usually, they would remain on the solea. 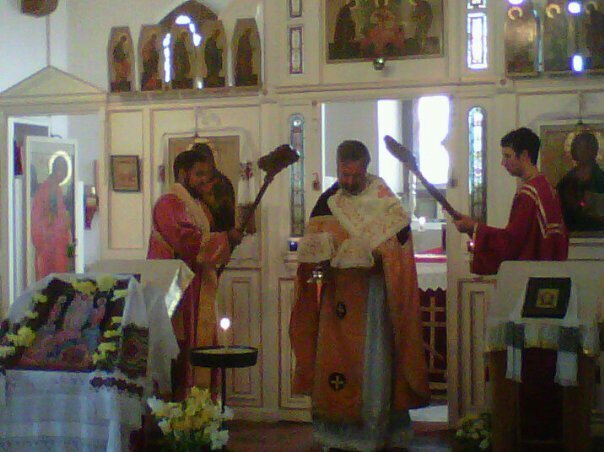 The use of the processional Cross during the Divine Liturgy properly belongs to the ceremonial of the Patriarchal Liturgy, that is, a Divine Liturgy at which the Patriarch or other chief bishop of an autocephalous church is presiding. It is not carried when any other bishop or priest serves and is, therefore, not mentioned in this guide. In places where the local custom is for the processional Cross to be used more freely, it may be desired to adapt the instructions to reflect this practice. The Cross is, of course, always carried for cross-processions. The method of carrying out the entrances assumes the "short" route, so that the clergy do not descend the solea and, at the Great Entrance, the priest faces west. In places where the long processional route is taken or where the priest faces east, the instructions may need to be adapted accordingly. The practice of servers opening the deacon's doors prior to going to the High Place for the entrances may seem odd. This stems purely from the fact that our parish does not (yet?) have enough servers to see to the opening and closing of the doors in addition to those taking part in the entrances. Perhaps in time, if it is God's will, we may be blessed with more servers. In the meanwhile, having the doors opened and closed in this way seems tidier than the alternative. If your parish has enough servers, it is perhaps better for two servers to man the doors, opening and closing them as people need to pass through them ceremonially. Traditionally and canonically, we stand for prayer on Sundays in honour of the Resurrection, while kneeling to pray is reserved for other times. Over time, in many places, this prohibition on kneeling has been broadened to mean that the making of prostrations is also not performed on Sundays, while in many other parts of the Church, (particularly the Russian church, including at Christ the Saviour Cathedral in Moscow itself), the appointed and customary prostrations are made as usual, regardless of the day of the week. As both traditions co-exist within the Church, at St Elisabeth's, we treat this as a matter of personal piety. However, this guide indicates the times when a prostration is usually made. There seems to be some confusion over the use of the censer at the Great Entrance. Very simply, the current rite calls for the Gifts to be censed at the Oblations Table immediately prior to the Entrance, and again on the Holy Table immediately after the Entrance. There is no direction for the Gifts to be censed during the procession itself - and certainly not by anybody walking backwards. (The only place this is mentioned is in the rubrics of Liturgy of the Presanctified Gifts on the weekdays of Great Lent, when the Gifts have already been consecrated as the Body and Blood of the Saviour, and so are censed by the deacon, who does not turn his back on them). Therefore, if there is a deacon, he carries the censer over his shoulder simply as a means of transporting it from the Oblations Table to the Holy Table. If there is no deacon, the censer may either be put away in readiness for the censing after the Entrance or, if there is not enough time, a subdeacon or server may carry it discreetly in the procession. Our preference at St Elisabeth's is to put the censer away and not to carry it in the procession. Aside from anything else, the action of censing with the censer is very closely associated with the liturgical role of the order of deacons, as our iconographic tradition and burial rites bear witness. This is also reflected in our public liturgical practice, as the rubrics do not allow for anybody below the rank of deacon to cense anybody or anything, (with the exception of the use of a hand-censer at reader services in some traditions, usually at private prayers in the home). For the same reason, also not mentioned in this guide is the practice witnessed in some convert parishes of a server censing the priest after relieving him (the priest) of the censer. This is a direct importation from the western liturgical tradition, where the liturgical censing of people by laymen is permitted in some instances. It seems out of place in the Byzantine liturgical framework followed by the majority of Orthodox. Anciently, the three antiphons of the Liturgy were sung while the clergy entered the church in procession, and the Lesser Entrance was precisely that: the entrance of the clergy into the altar as a culmination of the procession. In modern times, although the preparations and vesting now take place within the altar, we still think of the Lesser Entrance as the beginning of the Divine Liturgy proper. Therefore, at this point, the priest gives the servers a blessing to enter the altar to perform their ministerial duties. In some places, this blessing is repeated on each occasion that the servers re-enter the altar after some ceremonial action, such as after the Gospel and the Great Entrance. However, these additional blessings are uncommon and seem superfluous. They are not observed at our parish and are absent from this guide.